I just finished reading a great account of a cruise aboard the Pacific Sun, entitled 'Cruising all about the fun' by Paul Rush from The Southland Times in Invercargill, New Zealand. For Discount Cruises go to http://cheap-cruises.co.nz. You can save up to 51% on some fares for the Bounty Discovery cruise, departing at the end of March from Auckland and visiting Norfolk Island, Noumea, Ouvea, Port Vila and Mystery Island. 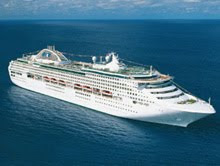 Or save up to 53% on fares aboard the Dawn Princess for the Hawaiian Discovery cruise in April 2010. Back to the story -- Paul Rush went on a cruise around the Pacific and reports that the focus is on fun. As well as writing about the sights -- "A brilliant orange glow on the horizon heralds the dawn of another glorious day on the Pacific Ocean" -- he details the various activities you can take part in, including craft classes, circus performers, dancing and more. He also reports on some tongue-in-cheek behaviour from the cruise director: "He gleefully tells us great movies will be screened during the cruise, emphasising titles like The Poseidon Adventure, The Perfect Storm and Titanic. I wonder whether he's a masochist or a comedian." Read more about it here at here at Stuff.co.nz. But don't forget to book a discounted fare while you can -- for Discount Cruises check out http://cheap-cruises.co.nz. Video: Pacific Sun in her home port of Fremantle.